I am not an elephant! I am not an animal! I am a human being! I... am... a man! (SPOILERS) It seems to be the current curse of the fledgling talented director that a much-feted indie debut leads to wooing by Hollywood and subsequent, if not dissipation, then diluting of talent, as distinctiveness and individuality are drained away and homogenised. Four decades ago, David Lynch was someone who took exactly that path, transiting from one of the all-time cult movies to the most darling of respected genres, the period piece. And then he went and made a hugely-budgeted sci-fi blockbuster. Clearly, it was career curtains for the one-time auteur. I won’t come on to Dune just yet, but The Elephant Man, his sophomore film, is an unassailable classic, and manages to get right in approach, tone and storytelling what so many period movies get wrong. Which is mostly that it isn’t starchy. Or at least, most obviously. It has starchy characters, observing societal norms, but the filmmaking is neither rigid nor perfunctory. Not for Lynch the staid virtue that would make Merchant Ivory Oscar mainstays in the latter part of the decade. And yet, Lynch’s film also troubled the Academy for big prize consideration. Indeed, whenever he strays outside of his hyper-weird, preferred narrative constructs (see also The Straight Story) awards tend to come calling (and even occasionally when he’s just being full-on weird: Mulholland Drive). The other such period romp of the decade, unbound by such obvious convention, that springs to mind is Amadeus. But where that film revelled in its clash of excess and restraint, paralleling Mozart with a modern rock star, it also shares a distinct characteristic with Lynch’s picture; a palpable, sustained emotional pulse that cuts through the costumes and drapes. Amadeus’ is found in Salieri’s disgust and jealousy of the famous composer, whereas The Elephant Man’s is revealed through John Merrick’s unearthly sanctity and purity of spirit. It’s the kind of centre that in any other hands would surely veer towards the horrifically sentimental and maudlin. I note some have accused it of same, but I would suggest they fail to distinguish between the sentimentalised and the genuinely emotive; I don’t see the excess and indulgence here that goes with the former. One wonders if they would have preferred a clinical analysis of the case, whereby empathising with Merrick is thrown out of the window in favour of cold, distanced observation. Surely it is as Pauline Kael argued in her review, that it “doesn’t stray from the Victorian framework (Lynch) constructs; nothing is interpreted… and so nothing is sentimentalized in a modern manner”. Another director might have been so wrapped up in eulogising the man and his burden that the heart of the piece was lost, but for all his ability to mimic such emotional displays for absurdist purposes in other movies, The Elephant Man finds Lynch working entirely in the service of his subject, rather than distancing himself or unleashing his bag of eccentric tricks. There are moments of strangeness, and that sound design is as industrial and oppressive (well not as oppressive) as it was in Eraserhead, and the black and white visuals (courtesy of Freddie Francis) retain something of the toxic, suffocating hellhole of urban degradation of his first movie, but Lynch so clearly feels for his protagonist (as opposed to indulging him) that the result is a rarity, a film from the director where the sympathetic response is first and foremost, and the distancing from the characters is absent (for all its unadorned virtues, The Straight Story is also fairly remote). Lynch even uses Samuel Barber during Merrick’s final moments to profoundly moving effect, his effective suicide a point of poignant release that makes Oliver Stone’s later appropriation seem merely crass. Hurt’s Merrick is profoundly affecting, gentle, delicate, suffering (and Hurt suffered for his art, having to work alternate days due to the encumbrance of the prosthetics). Frederick Treves (Hopkins), in introducing us to this character and world, is the audience identification figure, however, even though the compassion displayed in the moment he lays eyes on Merrick (the single tear), showing that he is genuine, lapses into remote scientific inquiry whereby he presents the man before his peers of the Royal Society, a subject to be scrutinised. As such, we’re invited to assess the picture’s most complex character, aware before anyone in the film itself identifies that his devotion towards his career leads to a lack of consideration for the man within “the monster” (whom he refers to as “perverted, degraded, insidious” in form); he receives much consequent acclaim, and even when he wrings his hands in guilt (“Am I a good man, or am I a bad man?”) it is that of the man who would likely make the same mistake again. It’s a superb performance from Hopkins, moderating a mix of reserve, hesitancy, moral rectitude and tunnel-vision blinkeredness that’s as human a counterpoint to Merrick’s unreal inner beauty as one could conceive. It takes Gielgud’s Carr-Gomm, whom we initially expect to be a force of stern rebuke, to show the insights Treves lacks, through the latter’s assumption that his scientific understanding extends to the realm of the emotional and spiritual. Carr-Gomm corrects Treves when he says he believes he can imagine the kind of life Merrick has suffered (“I don’t think so. I don’t think anyone can”). Gielgud’s is as good as any performance the actor gave in his last few decades (and let’s face it, many of his films during that era were not so distinguished). Good performances too from Wendy Hiller as the initially dismissive then staunchly protective hospital matron Mothershead and an early appearance from Dexter Fletcher as Bytes’ lad. Freddie Jones’ Bytes and Michael Elphick’s Night Porter are cartoon villains of the most garish order; one might argue such a depiction is beneath the picture (particularly since Tom Norman, on whom Bytes is based, was apparently a decent man who treated Merrick well, in contrast to the monster of Treves’ memoirs – although, an earlier sideshow owner did treat him badly it seems), and a sequence in which Mothershead bashes the Night Porter on the head seems to have strayed in from a Carry On. Nevertheless, while the episodes of cruelty at the hospital are also inventions, if one were to stick to the facts of most true life stories they’d make highly unsatisfying movies dramatically. The emotional substance of Merrick’s treatment is believable, and that’s really why it carries such power. As such, the fairground escape from France is perhaps a little too close to a fantastic rendering found in a Disney fairy-tale, yet it also carries undeniable weight, culminating as it does in the Merrick’s stirring assertion of his worth beyond the currency of his surface appearance (“I am not an animal!”). As the Time Out review by Tom Milne noted, the picture leaves (intentional) question marks concerning the inner Merrick’s feelings, notably potential sexual stirrings in response to the attentions of his admirers, from the touch of a beautiful woman (Hannah Gordon as Treves’ wife) to the recitals with another (Anne Bancroft’s stage darling); this being a man whose one notable area of non-deformity is his genitalia. But this is entirely germane to a character who ventures no opinion unless asked, who is even assumed by the compassionate doctor to be an imbecile until he offers evidence otherwise. And what of the pervasively Lynchian in the picture? We see his attention to extreme close-ups, pushing against the macro world that divides reality, and the queasy fairground imaginings of the fate of Merrick’s mother trampled by elephants (based on the myth propagated by Bytes). It’s suggestive of an imprinting of a reality from beyond, the framing echoing that of Eraserhead’s external forces impacting on our world. And then again, in the final moments, as Merrick passes to the infinite (the angel that is his vision of his mother, quoting Tennyson’s Nothing will Die, subsumes the demonic elephants). There’s also the attention to body horror, besides Merrick himself, in Treves’ operation on a burn victim, something you can see previously in his short The Amputee and subsequently in Dune’s pustulating depravity of Baron Harkonnen. 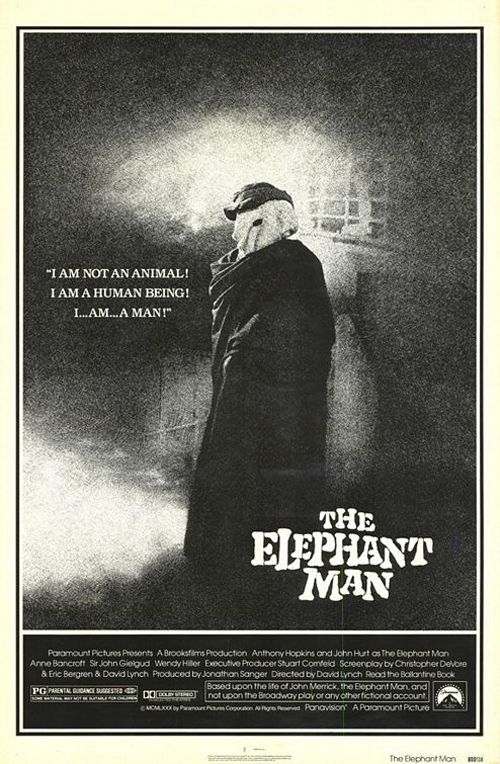 The Elephant Man was nominated for eight Oscars, including Picture, director and actor, winning none; the lack of make-up recognition led to the introduction of a specific category the following year. For my money, the movie should have swept the board (Ordinary People is a decent movie, but not Best Picture-worthy, unless you have Driving Miss Daisy as a yardstick, while Raging Bull may be the oft-cited stolen but is massively over-regarded). Apparently Mel Brooks, who produced, responded to Paramount execs’ requests for removal of the framing device with “We are involved in a business venture. We screened the film for you to bring you up to date as to the status of that venture. Do not misconstrue this as our soliciting the input of raging primitives”. Which, I think, told them. Adjusted for inflation, this is the director’s most profitable film. Kael, in her essay, referred to The Elephant Man having the power and some of the dream logic of a silent film. That’s certainly the way one feels departing its spaces. There’s a sense that, no matter what the attentions or intentions, Merrick cannot be treated with true evenness until he was left the real world. His initial salvation through the enlightenment of science is just another form of (refined) freak show, and Lynch retains this idea through his time as a célèbre of the social elite; far from sentimentalising, this environment and its illusion of dignity is shot through with an undercurrent of inevitability and pessimism. A figure such as Merrick, too rarefied to persist for long, can only persevere there a while, a beacon of the of the unquenchable spirit in the prevailing darkness.